Stacy Horn » Blog Archive » What am I going to do with myself? I just handed in my book. I’m a little flummoxed. Whenever I hand in a book it’s almost like I disappear. Now what? What am I going to do with myself now that I don’t have a book to work on every day? Which of course isn’t true. I’ve got to fact-check, get to work on promoting the ebook edition of Waiting For My Cats to Die, and many other things. But still, at the moment, I feel out of sorts. I’m supposed to be on my way to swimming, but I have a cat on me and you know how that goes. Can’t move. The tyranny of the sleeping cat. Speaking of which, did you see the piece in the Times about the new medical procedures (and the costs) for pets? 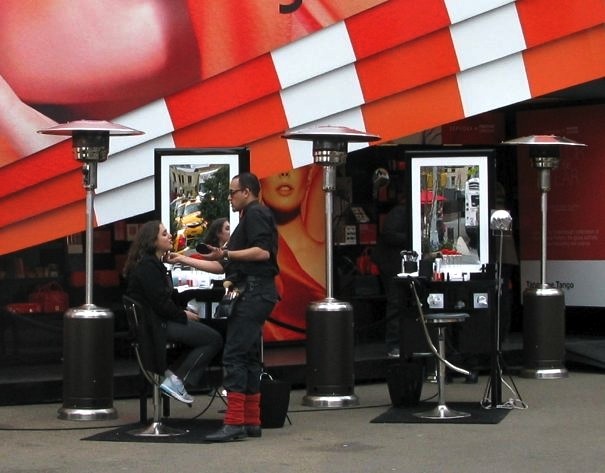 Sephora has outdoor makeover stations set up over in the Meatpacking district. Weird, but okay.